This a music installment of what is inspiring us at 12 oz. Legendary hip-hop group The Roots continues their onslaught of video releases to promote their forthcoming album undun. The latest highlights the Aaron Livingston-featured track “Sleep.” The album drops December 6. 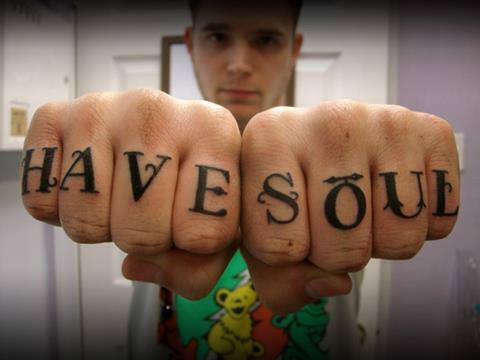 Starting my Tattoo career in Philly, I worked at a shop that tattooed and also did airbrushing. I was hire as a airbrush artist/tattooist. In 1998 I had the honor to meet and paint a T-shirt for The Roots keyboard player Kamal for a performance in NYC. I was cool to do art for a band that continues to inspire to this day. It’s that time of year again. YAAAAAAY!!!!!!!!!!!! Time to jump start that economy & Occupy Wall Street by shopping at independent shops ha ha. But if you’re like me, I get more joy out of giving. So here’s the sales pitch, “Give them the gift that they’ll have forever.” Or hell get one for yourself. Many of our customers with large project tattoos are buying these to get the extra discount on their sleeves and back pieces. And in the spirit of giving. From now to December 23, for every $50 you spend on Gift certificates, we will GIVE you an extra $5. And if you buy a $500 give certificate we’ll GIVE you an extra $100. Yes kids $100 extra. It can be all put in one Gift certificate or break it up into a couple. Long as you spend the right amount, you get the extra $. We are also collecting toys for kids in need at our shops. Stop by 12 oz Studios in Brooklawn or Deptford with a new unwrapped toy from now until December 20 and receive $10 off any piercing, $10 off any tattoo from 50-100, $20 off any tattoo from $101-200, $30 off 201-300, etc. It doesn’t even have to be used the day you bring the toy. You can use your toy money later on. You will also be entered in our raffle. We will be giving away a free piercing, gift certificate, and hoodies, t-shirts, We’re giving a lot of stuff away! Every kid deserves a great xmas, together we can all help! I wanna thank everyone who has helped so far and all of you that are going to help. Let’s bring a little Joy so some kids. Hey Everyone. For those that haven’t seen the work of our piercer AJ, Here is his Feature. AJ is a very accomplished piercer. In my 14 years of tattooing I’ve work with many piercers. He’s probably the most obsessed piercer I’ve met. Even with all his years of experience he is still constantly learning, researching, and sharing information with his peers in the piercing community to stay updated on technique, jewelry quality, piercing placement, aftercare and any other bit of information he can get his ears on.. Like I said…Obsessed.. obviously in a good way. You’ll know you’re getting the best piercing, with the best quality jewelry out there. He is open to answer any of your questions and will definitely have all the answers. For prices and Questions please call the studio and talk directly with AJ. You will then know for certain why he will be doing your next and every other piercing you ever get. AJ does his magic at our 12 oz Studios Deptford Shop. Here we have a new modern studio with a larger show room that we can easily and positively say has the largest high quality piercing jewelry in South Jersey. 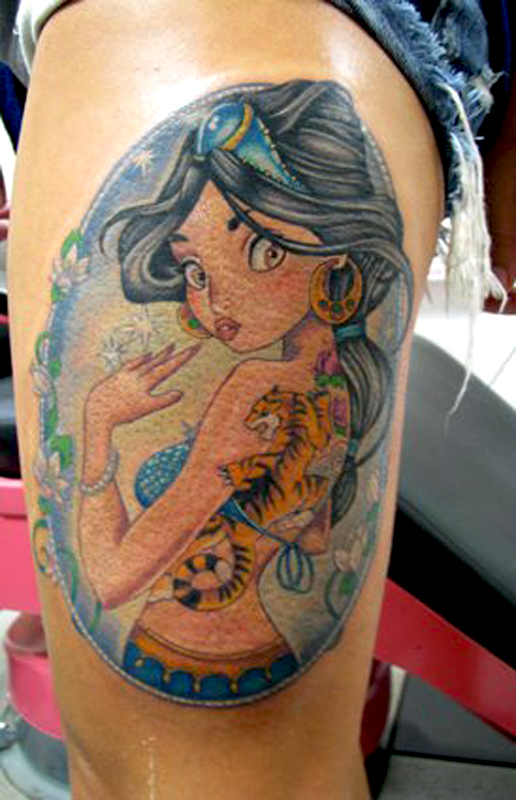 Today Feature Tattoo goes to Tami. She is our newest addition to the 12 oz Family. Make sure you check her work out. We posted Meghan’s new tattoo work on our facebook page and these pictures have had so much response that we had no choice than make it our Feature tattoo of last week. These pictures were taken right after they were done. Both girls sat through the whole tattoo in one sitting. Four hours each. Tough girlie girls. Enjoy. 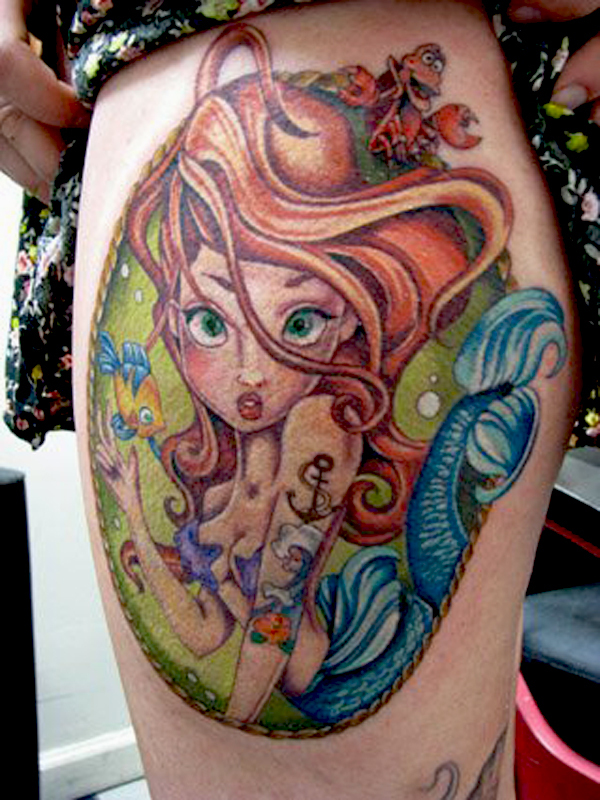 We are going to start posting tattoo of the day, and the week. You great people can help judge. Like us on face book and like the pics. Eventually there will be a prize for you…Our fans.. Remember with out you our work would just be doodles. Thank you 12 oz. customers. Tattooing has changed a lot in the 14 years that I have been doing it. I once quoted, “that you can’t move forward in your future, if you don’t understand or appreciate your past. The Legends are either dead or growing old. 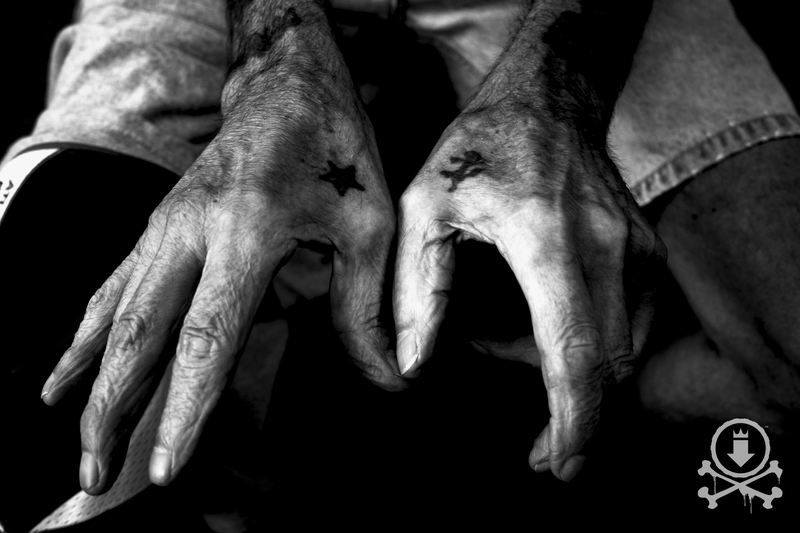 Their legacy continues with ever stroke of a needle, their artwork or the machines they’ve left behind. Wether you are a new skool or traditional artist, these pioneers set the stage for you to shine. For those legends that passed. We appreciate what you left behind. Every time people see a green faded tattoo, I see living history. We need to capture these before it’s long gone. Every time I’m out of the shop, I’m on the look out as well as my fellow artist at the shop. Here is one instance of finding living historical art. This is Ed. 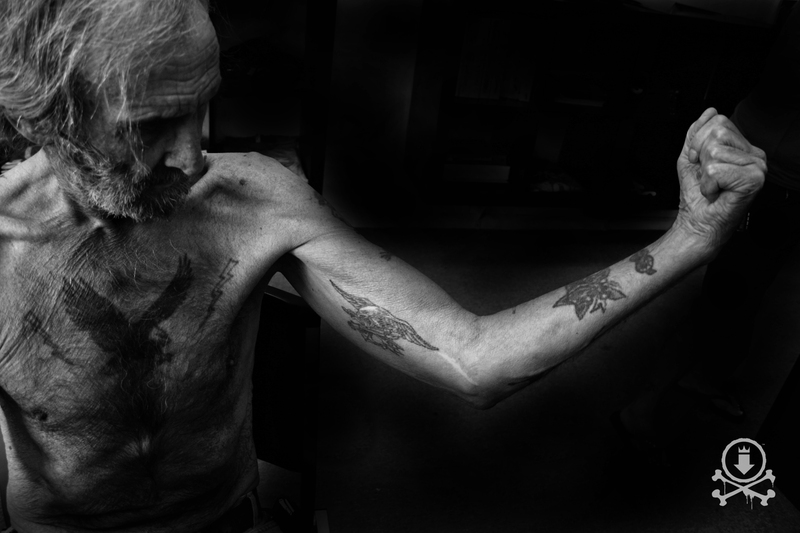 Brendan met him at a local convenience store and invited him to 12 oz Studios to talk about his classic tattoo work. Ed is one of those old navy guy that everyone equated to the “type” that got tattooed. 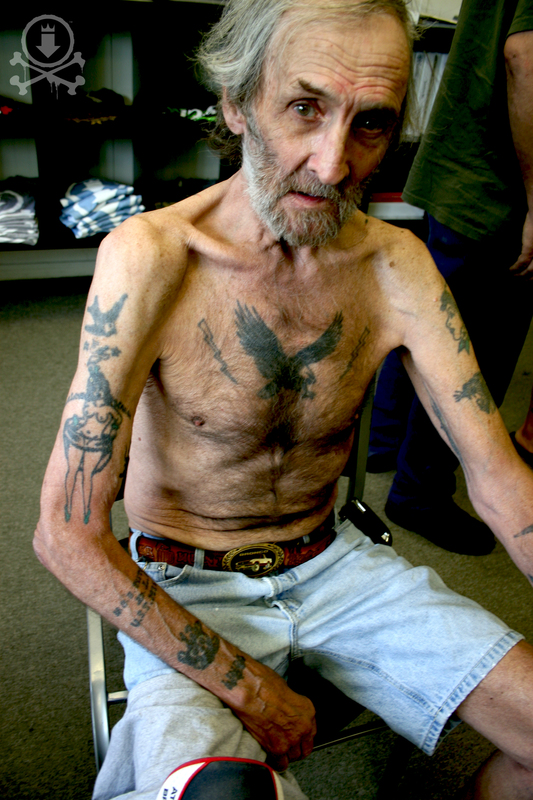 He first got tattooed in 1955 in Philadelphia by a man named “Pop Huff”. Ed was 15 and he used a friend’s ID that apparently looked nothing like him. Pop Huff put the swallow on his upper shoulder. 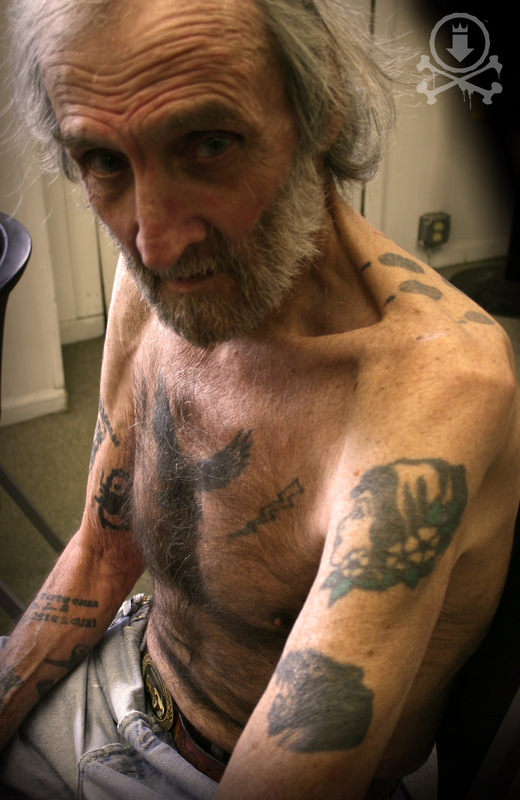 Ed was also tattooed by the local legend Sailor Eddie. 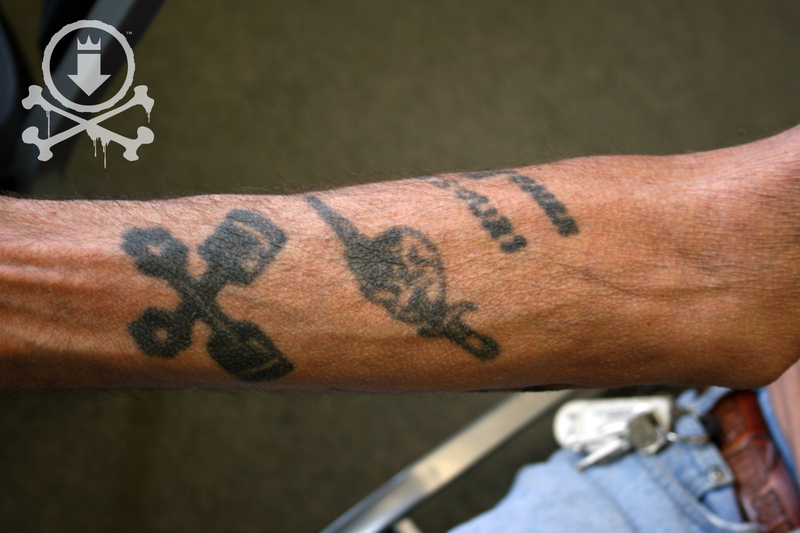 He was also lucky enough to be tattooed by Paul Rogers when he was working with Eddie in Camden, New Jersey. 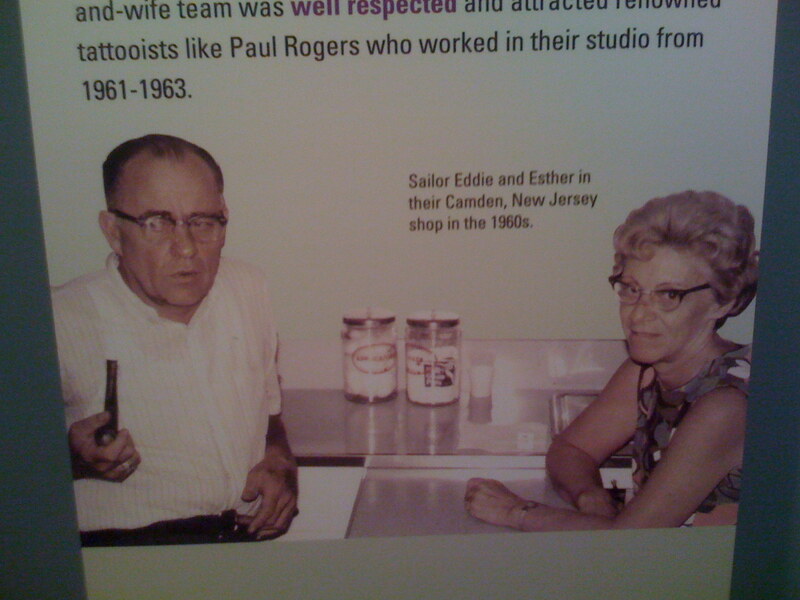 Ed referred to Rogers as “the old guy”. 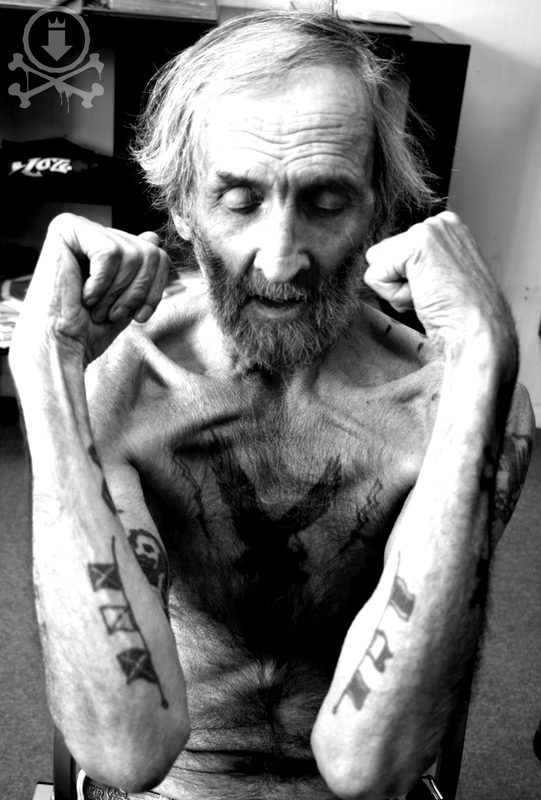 On Ed’s left shoulder is the classic image of the “gypsy head” and below that a panther head. Both of these were done in Japan by hand. They weren’t applied in the traditional Japanese tebori style where a group of needles are attatched to a stick. Ed described the artist using some bamboo and some other object to tap the ink in. “How long would this take nowadays? Half an hour maybe? This took 5 hours. 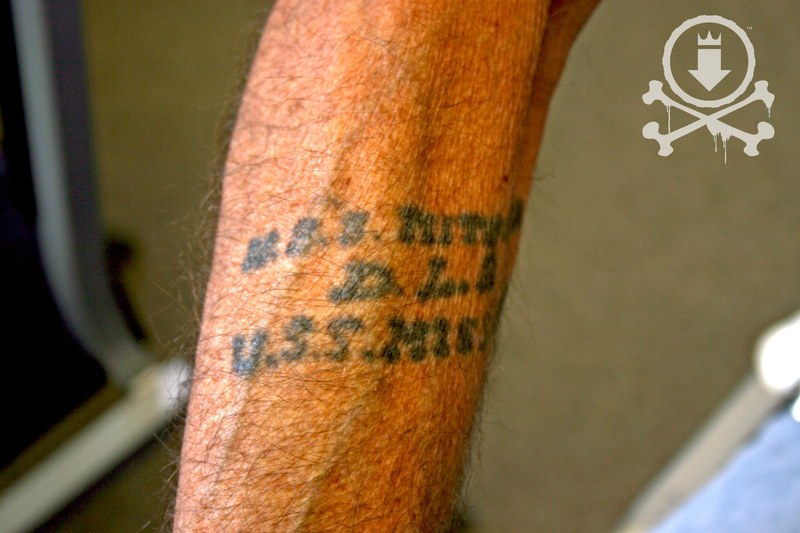 Hurt like hell!” Ed is one of the few people still around that has collected some fantastic permanent pieces of history. Any time we come across these aging living canvases like our friend Ed, its really in our best interest to take the time to ask their story and show some respect to the original artists who decorated these colorful characters.